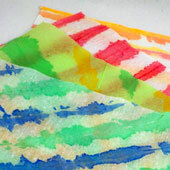 Tissue paper painting is an easy technique for making colorful tissue paper. Simply pleat a piece of tissue paper and paint the folded edges. Repeat the process once or twice to create an even more exciting design. White or pastel-colored tissue paper may be used. The dye in some colored paper may run when wet, but this can be considered part of the design. 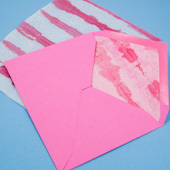 The painted tissue paper may be used to wrap packages, line envelopes, to cover a notepad, and in greeting cards, suncatchers, collages, and much more. Note: The tissue paper will become fragile and easy to tear when wet. Children will probably need	help with the unfolding step, or they may tear their creations. You may also want to experiment with different brands of tissue paper, since some will work better than others. Tissue paper painting is great for family, classroom or group craft time. Everyone will love the results. It requires no more preparation than the gathering of materials. Optional: Ironing board, surgical gloves. 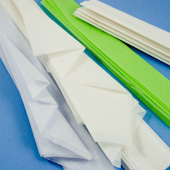 Cut a large sheet of tissue paper into quarters or smaller pieces. Make an accordion pleat. The pleat can be in any direction—horizontal, vertical, diagonal, radiating from one corner or edge. Just be sure to fold the paper back and forth to form the accordion pleat, and keep the folded edges on both sides even. Folds that are from 1" to 2" deep work well. You can fold the paper in half or quarters before making the accordion pleat. The technique is easy, but it can get messy. Spread newspapers to protect the table and the floor. You may also want to wear gloves to keep your hands clean. Hold the edges on one side of the pleat together with a chip bag clip or some bulldog clips. Paint the edges on the other side. Repeat for the opposite edge. If you use poster or acrylic paint, thin it with water. Carefully unfold the paper, gripping dry spots. The paper is very fragile and will tear easily. Handle it as little as possible, and lay it on newspapers to dry. When it is dry, it can be ironed to remove the crease marks. Kids, get help to use an iron. Tip: The wet tissue paper may stick to the newspaper. Check when the paper is about half-dry, and carefully lift it from the newspaper to avoid sticking. The pleating, painting, and drying steps can be repeated to make more complex designs like checks or chevrons. Just pleat the paper in a different direction, and paint. Painted tissue paper can be used in a wide variety of ways. It is especially useful in gift wrapping and craft decoration. It can be used to wrap or decorate packages, line envelopes, cover greeting cards, in decoupage—just use your imagination. That's it! 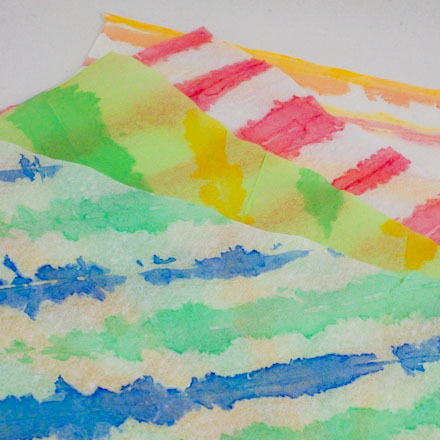 How will you use your painted tissue paper? Tip: Use painted tissue paper for gift wrapping and to line envelopes. 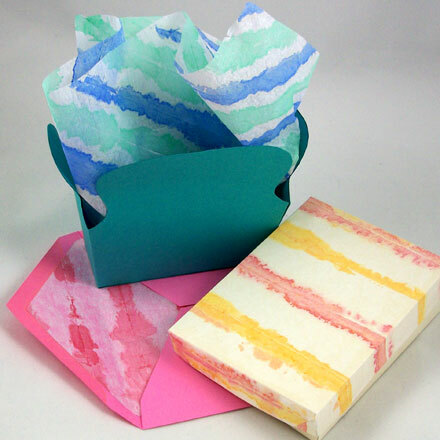 You might also use the colorful paper to cover Rectangular Box lids. Tip: Make vertical, horizontal or diagonal accordion pleats. Fold the paper in half or quarters before folding the pleats. Tip: To line an envelope with tissue paper, first cut the paper to fit the envelope width and about three-quarters of its height with the flap open. Trace the envelope flap at one end of the tissue paper and cut. Glue the lining inside the envelope, being sure not to cover the flap adhesive.